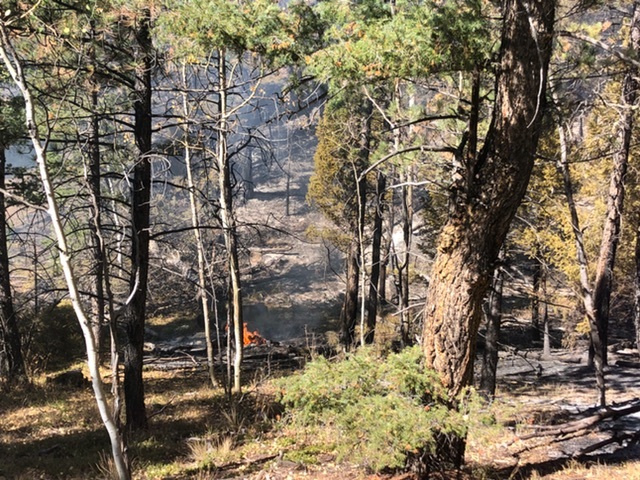 Update: Feb 14, 4:40 pm Today the #CR34fire has been called 100% contained at 12:00 noon. The final size of the fire is 3812 acres. Update: Feb 13, 7:10 pm Fire fighters will be off the incident #CR34fire by 8:00 pm. Firefighters will be back on the fire in the morning. No updates on acres burned or containment. 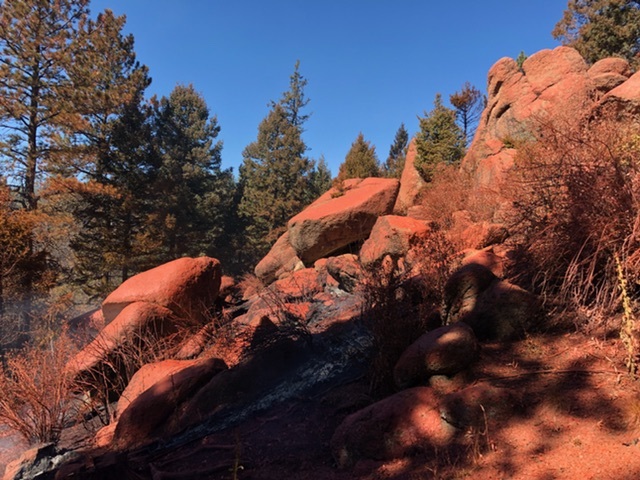 Update: Feb 13, 5:20 pm Fire management for the #CR34fire is calling the fire 90% contained. 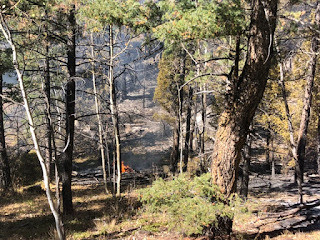 Update: Feb 13, 5:10 pm #CR34fire is now estimated at 3,800 acres. 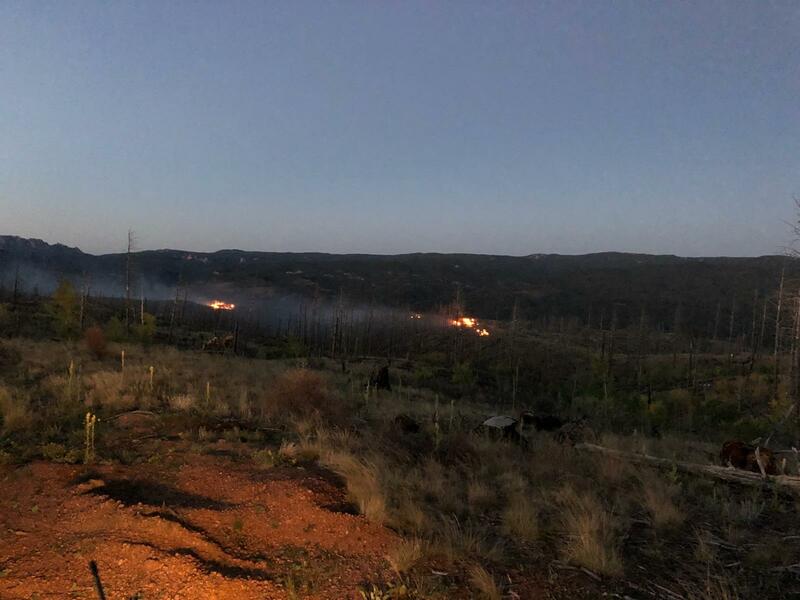 Fire is working as a unified command consisting of Baca County and U.S Forest agencies. Location: Baca County, Comanche Ranger District, 10 miles South of Springfield, CO. Started close to the Oklahoma state line moving north toward Walsh, CO. The #WilkersonFire is now 100% contained, one engine will be on the fire tomorrow. Fire received light precipitation today, a few smokes still visible on the incident. The #WilkersonFire has about 45 firefighters on scene consisting of USFS and Park County resources. The type 3 helicopter has been released. Resources engaged securing perimeter and mopping up hotshots. 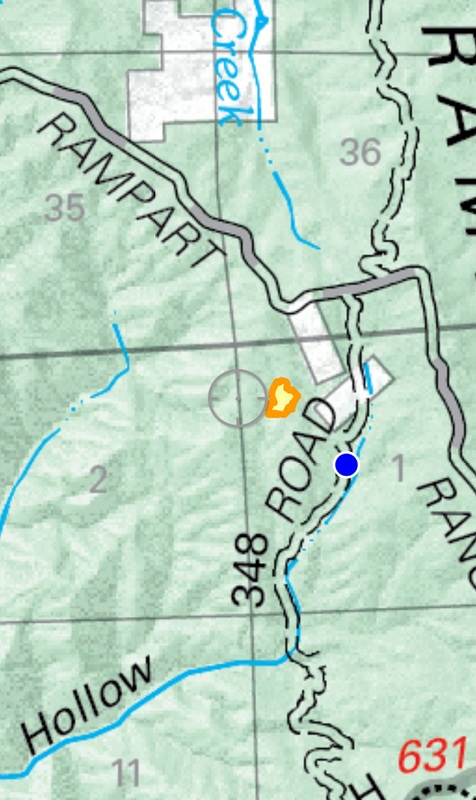 Location: Park County, South Park Ranger District, 8 miles West of Lake George, CO. Containment is at 90% and the size remains 160 acres. The larger fuels producing smoke are expected to continue until they are fully consumed or when a weather event puts out the fire. The area will be open for recreation use starting tomorrow at 8:00 am. A USFS fire engine will be on scene patrolling. Two engines are spending the day improving the fire-line and patrolling the perimeter. Containment is at 75% and the size remains 160 acres. The larger fuels producing smoke are expected to continue until they are fully consumed or when a weather event puts out the fire. Location: Douglas County, 3 miles east of Westcreek, CO, 8 miles north of Woodland Park, CO.
Resources: Forest Service type 2 crew and 3 engines. 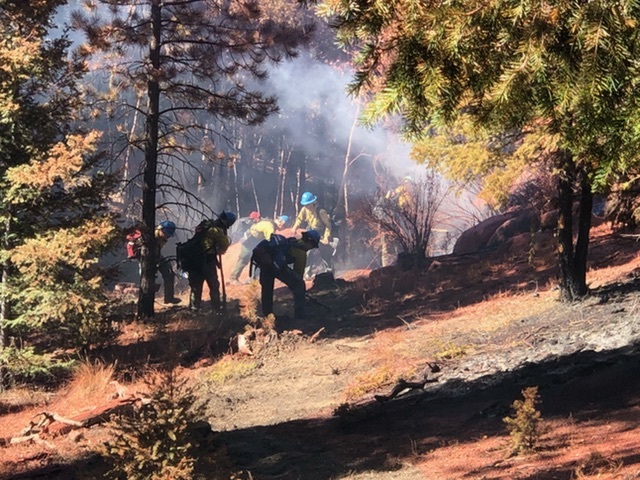 Burning operations around noon on Sunday. 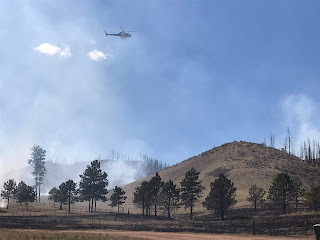 The helicopter dropping "ping pong balls" on the Turkey Track 8 Fire on Sunday. Firefighters provided this image of them securing the line on Saturday evening. Photo Courtesy of Laura Aker. At 11:57 am containment on the #LongHollowFire is at 100%. Firefighters are improving the fireline and working on hotspots. At 6:00 pm containment on the #LongHollowFire is at 80%. One type 2 crew is being released at the end of today's shift. There will be one 20 person type 2 IA crew still staffing the fire tomorrow. Two 20 person fire crews are back on the #LongHollowfire working to gain containment and mopping up hot spots. Fire has not grown and is still at 5.2 acres. At 6:00 pm containment on the Long Hollow Fire is at 50% and some Photos have been added. Numerous resources are on the fire constructing and improving fire-line. There's two type 2 crews along with several engines. Fire is now reported at 5.2 acres. 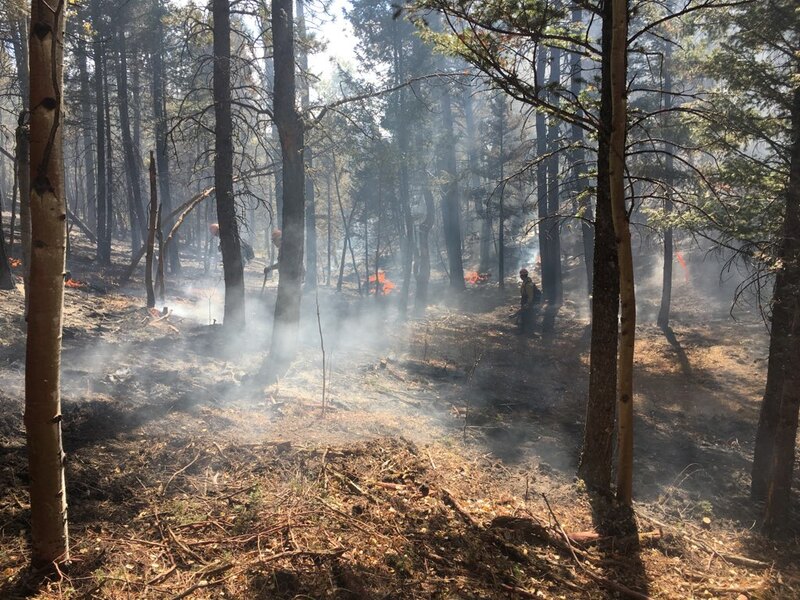 Resources: Forest Service and multiple Douglas County cooperative resources. There were two Large Airtanker drops and two type 3 helicopters doing water drops. 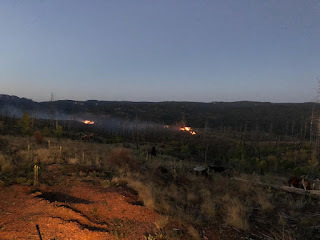 A rapid response to the lightning-caused Lion Gulch Fire on Friday evening utilized two Air Tankers to get a retardant line around the fire. 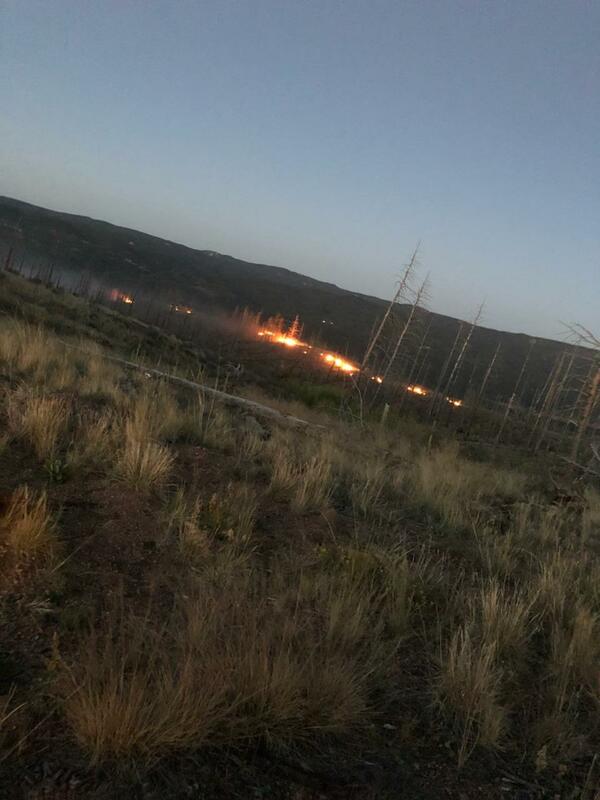 The fire was declared contained on the evening of Sept. 1. 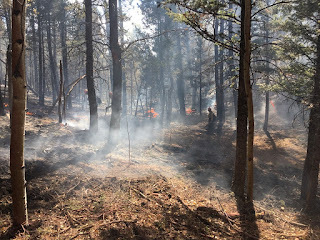 It is likely that smoke will continue to be seen occasionally from points along the North Fork of the South Platte River and also from Pleasant Park Road in Conifer. Fire crews will be taking actions as needed to safely put this fire out. Photo from the helicopter on 8/31. 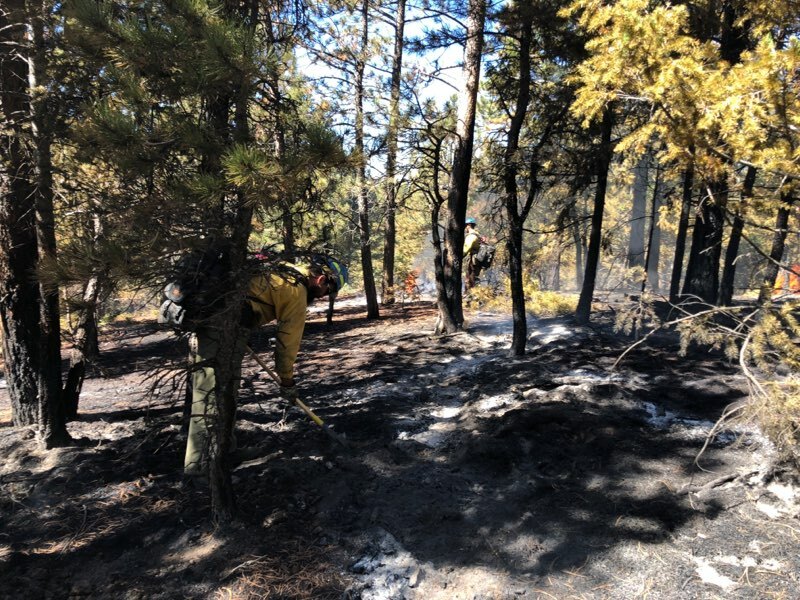 Due to the high hazards of working in dense standing dead trees, on steep terrain, and in thick deadfall from the Hayman Fire, crews constructed indirect containment lines away from the fires edge, in areas where the risk of falling dead trees was reduced. 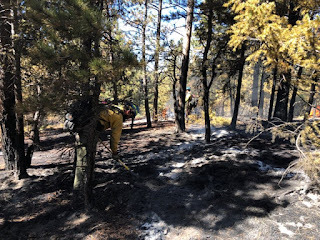 Firefighters continue to monitor the fire and patrol these containment lines. 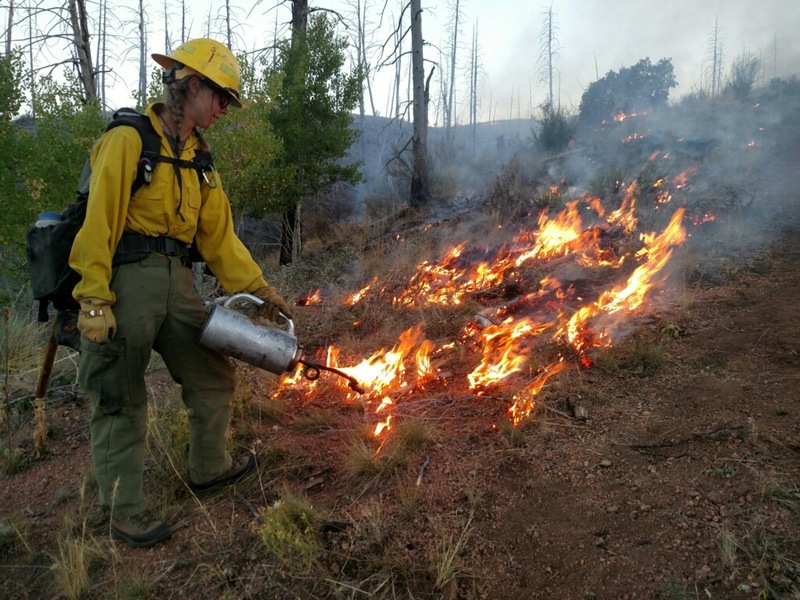 This full-suppression strategy allows for lower risk firefighting conditions. Fire slowly burning a large log on 8/11. 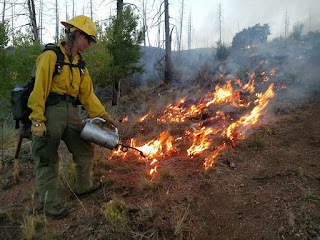 Fire securing the steep south flank on Thursday 8/9.